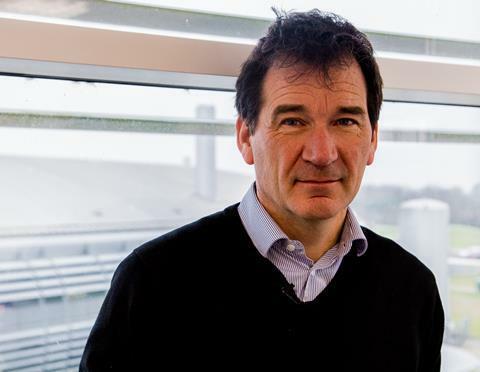 ‘I thought working here would be really exciting … I was absolutely blown away by the science.’ Andrew Harrison grins as he recalls his visit to the Diamond Light Source synchrotron in 2013, a visit that led to him being appointed as the facility’s chief executive just a few months later. From his office, the view is filled by the synchrotron building: a silvery torus, sleek and futuristic, a quarter of a kilometre across. Inside, over 600 staff and scientists are helping researchers from all over the world bring Diamond’s light to bear on their science. In the experiment hall itself, standing on the walkway that skirts the building’s outer curve, the view is more utilitarian – all concrete blocks and steel beams. It’s deceptively still, a background hum all that indicates the storage ring is hard at work: radio frequency accelerating electrons to near the speed of light, with magnets deflecting them round bends to produce the bursts of radiation that radiate out from the ring; beams narrower than a hair and billons of times brighter than the sun. 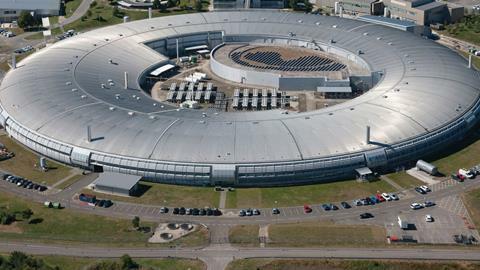 As we bustle round the circuit, glass-fronted offices slide past showing glimpses of the synchrotron’s science on their walls: structures and patterns; diagrams and equations. The molecules and materials on display reveal the different disciplines served by the synchrotrons’ six scientific groups, or ‘villages’ as they’re charmingly called. We are in rural England, after all. ‘From the life sciences, through physical sciences, engineering, earth sciences, palaeontology, cultural heritage … it might sound a bit corny, but [the research] is so diverse,’ says Harrison. It does sound a little corny. But it also sounds honest. When I ask what it’s like working here, every scientist has the same answer. Principal beamline scientist Fred Mosselmans has been a synchrotron scientist for 20 years, and a resident of the spectroscopy village since Diamond first opened, where he now runs the I18 beamline. In that time, he has worked on brains, asteroids, nuclear waste and even bits of the Mary Rose. It almost seems he’s never done the same thing twice. ‘One of the best things [about Diamond] is you see a lot of different science. [Users] have an enormous range of science problems, and the techniques that we have can hopefully address them,’ Mosselmans modestly explains. Just next door, a few degrees further around the bend, is the I19 beamline and its principal scientist David Allan. Like many of the staff here, Allan came from a career in academia and never looked back. ‘We see a huge variety of science here; the world comes to see you. And you work with people you wouldn’t normally meet in a university department – engineers, software developers and so on, who all have to come together to make the whole thing work.’ And then keep it working, he adds, because most of the equipment is the only one of its kind, designed and built specifically for a beamline and its users – such as the diffractometer and gas cell currently being used by Ross Forgan from the University of Glasgow and Stephen Moggach from the University of Edinburgh. In the control room, Forgan and Moggach are huddled round a screen, working with beamline scientist Sarah Barnett. 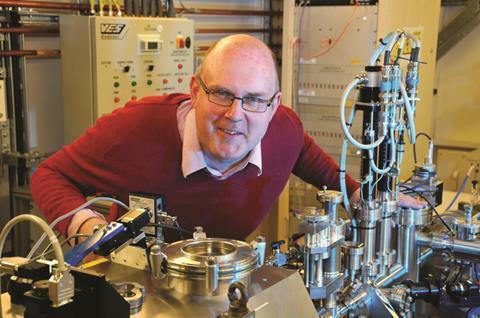 ‘Half of the work on this beamline will be familiar to chemists as ‘standard’ x-ray crystallography’, Barnett explains; ‘working out the structure of a small molecule crystal. Then the other half is doing things to that crystal. So you might be applying gases or pressure, or exciting it with lasers to see how that changes the structure.’ Today, Forgan and Moggach are working with material-of-the-moment MOFs, using the gas cell to introduce different gases. ‘When you expose [MOFs] to gases, they can often change size and shape. One of the nice things about the setup here is that we can actually expose them to high vacuum to see whether the materials are stable on taking out the solvent, and then we put the gases in,’ Moggach explains. As it happens, MOFs are also Barnett’s area of expertise, but she notes that this is not the norm; beamline scientists have to be generalists, working across all fields. ‘We’re not focused on one particular area, we’re helping everybody who comes here do their particular research,’ she explains. That versatility extends to the role itself: being part scientist, part consultant, part engineer. ‘You become a jack of all trades,’ adds Allan, ‘you have to have an understanding of what’s going on to know for example ‘Why is there no beam?’ – there could be 101 reasons why. You’re problem solving all the time’. 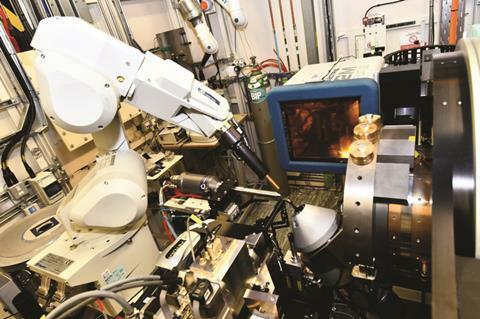 Through that process, Diamond has been growing steadily, adding new techniques and beamlines. ‘We’ve got 28 [beamlines] today. We still got plans on funding for another five; it’s going to be 2018 before we complete 30 beamlines,’ he explains. And with the new beams will come new staff, such as Rosa Arrigo. For the last two years, Arrigo has been working in the surfaces and interfaces village on the Versox (versatile soft x-ray) beamline, which came online in July. Before Diamond, Arrigo was a researcher in heterogeneous catalysis, and a regular visitor to the synchrotron. ‘[Versox] was a proposal produced by a community of scientists who wanted a technique that is surface-sensitive and that can investigate the material under conditions close to those where it will be used,’ explains Arrigo. Part of that means being able to have an atmosphere in the beamline, rather than the usual high vacuum conditions. 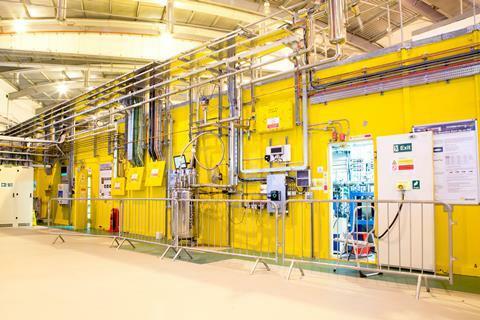 When it goes live, this will be the highest pressure beamline in the world – anything up to a whopping 100mbar. ‘High’ is a relative term, Arrigo laughs. But while it’s a couple of orders of magnitude away from industrial conditions, it’s still far more informative than doing the experiment under ultrahigh vacuum, she explains.